Brown crown, cheeks, and shoulders. Distinctive rusty red, broad, barred tail tipped with white and a narrow black band near its end. Buff white underparts with heavy brown markings across the lower breast and on the flanks. 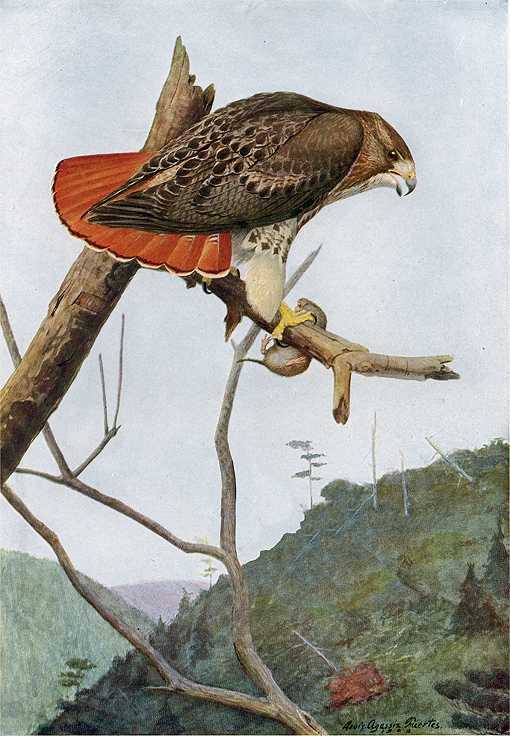 Red-tailed Hawks are the largest of the common American hawks, almost two feet long with a four foot wing span. Inhabits forests and groves in most of Canada and Alaska as far north as there are trees, throughout the lower 48 states, Central America and some Caribbean Islands. 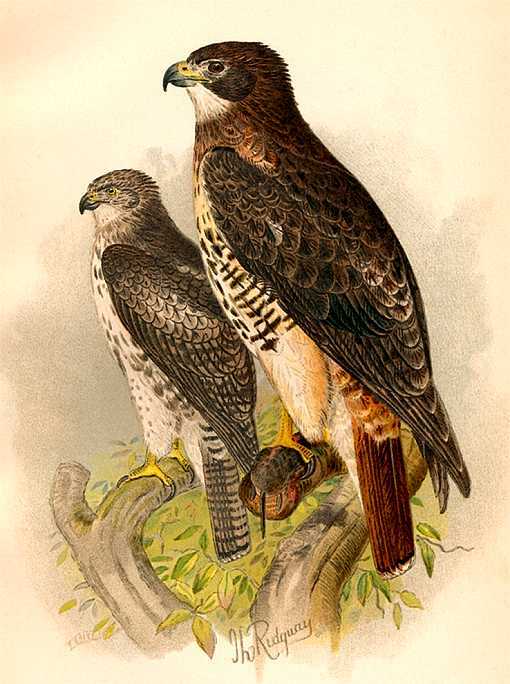 Northern hawks migrate short distances. Soars high overhead in great spirals searching for prey occasionally emitting a weak distant high pitched whistle. Suddenly lifting its wings above its back it shoots earthward like a meteor slowing with its outstretched wings in the last second before gripping its prey with talons. Eats mice, rabbits, gophers and other small mammals, birds, reptiles, insects and crayfish. In good seasons when flora thrive, so do rodents, and so then do hawks and owls. Builds a nest high in trees, often more than 50 feet high, out of rather large sticks lined with smaller twigs, strips of bark, and its own feathers and sometimes used for many years. Their nests are usually near the tops of trees in forests near clearings, and groves in open country where they can observe broad areas from a high perch. Lays two or three, sometimes four dull white irregularly marked eggs which hatch into helpless downy covered young after about four weeks incubation. They grow quite large, as large as the adults, before they fly out of the nest. The U.S. Fish and Wildlife Service recommends a Square Platform 24 inches on each side mounted 14′ or higher for the Red-tailed Hawk (same as for the Great Horned Owl). Mount 14′ or higher on a sturdy post or structure on a forest edge or in a clearing adjacent to the tree line. Take great care with this heavy, tall project. Have have it constructed by professional trades workers.